Here is a review of the supplement Vital Nutrients Vital Brain Powder. According to the company, this product is meant to support and promote brain health, memory recall, focus, and also alleviate the natural aging process of the brain. This product differs slightly from the normal brain supplements as it comes in powder form rather than capsule or tablet. Please keep reading this review if you wish to find out more about the product and its claims. 850 mg Acetyl L-Carnitine HC: helps to lessen fatigue in both the brain and mind. 600 mg GlyceroPhosphoCholine: promotes and supports brain health and also aids in brain recovery. 150 mg PhosphatidylSerine: benefits and helps memory along with learning, mood, concentration, and other cognitive functions. This product also contains soy. The recommended dosage is one teaspoon mixed into your drink of choice, unless otherwise directed by your doctor. As with any supplement, you should first speak with your doctor before taking it. If you are a woman who is pregnant or nursing, a person who is already taking a prescription medication or someone who has an existing condition, you should first speak with your doctor before taking. This product is not available for purchase unless you make an account on the website. While this may not be an issue, you can only make an account if you are a physician or a patient with a physician code. You cannot purchase the supplement otherwise. The company states they want to only sell to healthcare practitioners since they can determine what the best dosage is on a person to person basis. There is no information found on a guarantee. Due to the fact this product is not meant to be purchased by the general public, this company may not provide a guarantee. If you do have inquiries or questions about the product you can contact them through their website. There are no customer reviews for this product. Again this may be caused by the fact this product is only limited to certain people and healthcare practitioners. There are no reviews from any doctors or physicians about this product. 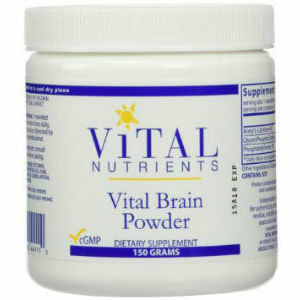 Vital Nutrients Vital Brain Powder seems to be a promising product especially since it does not contain any filler ingredients. However, the next part can be a pro or a con depending on which way you want to look at the situation. Since the product is only accessible to practitioners and patients, this not very accessible to the general public. Furthermore, there is no information as to whether or not this product works since there are no reviews or customer testimonials. While the company does reinforce the practice of correct supplementation, which is a good thing, the process of getting a code from your doctor can be frustrating for some. Overall, while this product may seem promising, we feel many people will find it to be a hassle to purchase. Henry Costa	reviewed Vital Nutrients Vital Brain Powder	on November 19th	 and gave it a rating of 2.